This French 'Potez' plane crash-landed at Sumburgh in 1981, and was brought here, 80km north, to its final resting place. One has to wonder why anyone would wish to do this, but also admire the tenacity that he must have shown. There is a descriptive plaque, which is just in the next square west. 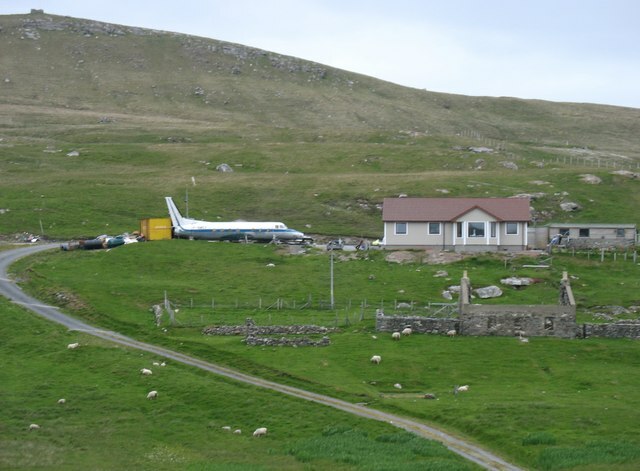 I have submitted a photo - see HU3690 : The "Shetland Potez" plaque. It is of poor quality (the moderator must have been feeling generous), partly but not entirely because the plaque itself is in bad condition. However I submitted it because there was no other image on site, the plaque will continue to deteriorate, and with judicious zooming you can make out most of the story behind this extraordinary scene.